Pleased to confirm that a paper of mine, entitled Unequal Cities of Spectacle and Mega-events in China and originally published in 2012 from the journal CITY, is going to be republished in French from the journal Alternatives Sud (AS) in March 2016. The republication is part of the journal’s themed issue on globalisation of sport, with a focus on mega-events and their implications on developing/emergings countries and populations. If you are interested in reading the full paper, you may visit the journal’s web site or here. A recent paper of mine on examining Guangzhou’s use of the Asian Games has just been published by the journal Urban Studies. Entitled “Urban Spatial Restructuring, Event-led Development and Scalar Politics”, it examines the use of the 2010 Summer Asian Games by Guangzhou in China as a means to justify its developmental vision that aimed at raising the city’s global profile and urban accumulation. Please click here to go directly to the journal page to download the paper. Updated on 12 October 2014: This article is now published in the journal’s latest issue, Vol 51, Issue 14. See the full table of contents of this issue here. Below is an abstract. Please e-mail me if you do not have access to the journal and I’ll be happy to share the paper. 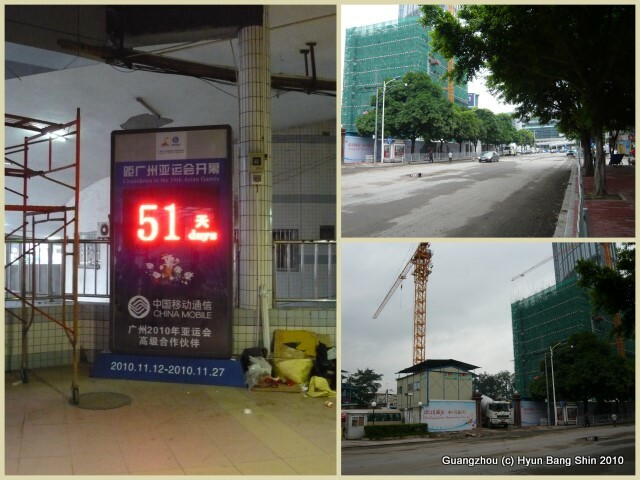 Other papers that have resulted from my project on Guangzhou can be found on this link (e.g. journal papers from Antipode and City). 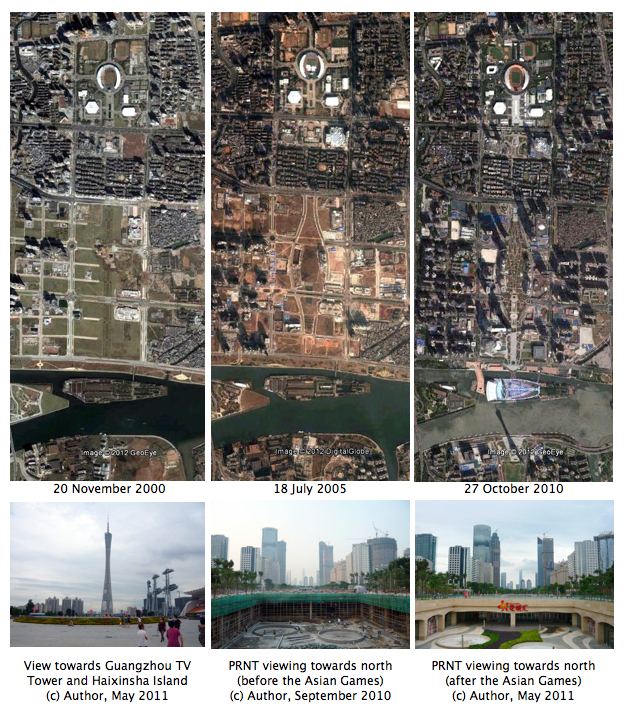 Below is one of the images used in the paper, which shows how the new central business district (Pearl River New Town or zhujiang xincheng �?�江新城) has changed substantially during the ten years prior to the Games opening. 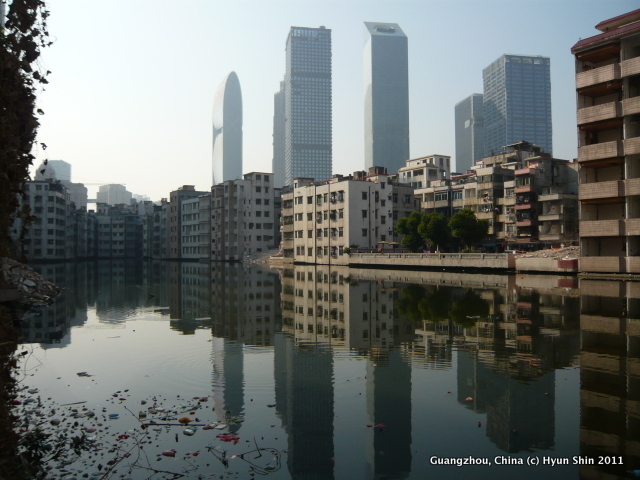 Urbanised villages in China refer to former rural villages that have been engulfed by urban expansion. Having lost farmlands, villagers invest heavily in dwellings to gain rental income from migrant tenants. This phenomenon is particularly pronounced in China’s Pearl River Delta region. These villages struggle to resist impending threats of demolition, though they give in eventually one after another, as is the case seen in this picture. 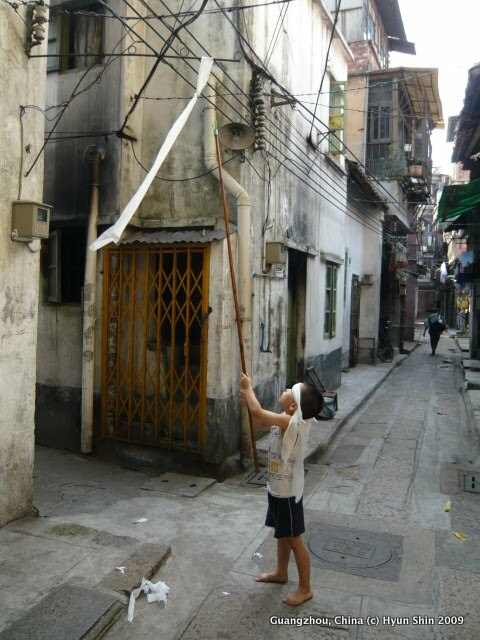 In this neighbourhood located in central Guangzhou, China, tensions are heightened due to impending demolition and residents’ displacement. For most local residents, continuing their lives after displacement becomes a real struggle, but for now, the child’s major concern is to get the paper-roll back on the ground. My official schedule in Guangzhou is over as of tonight. Just came back from giving a guest lecture on Olympic Games and Mega-event Politics to the students at the School of Urban Planning and Geography.